Size of Male: 70 lbs., 27 in. Size of Female: 60 lbs., 25 in. 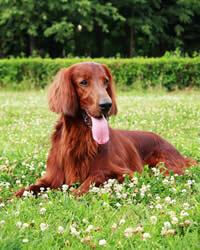 The tallest and most admired among setters, the red-coated Irish Setter is an attractive and showy breed. The dogs are sociable, jolly and sometimes willful in an adorable way. Some trainers remember the Irish Setter best for its para-photographic memory. The pooches don’t only retain lessons well but can hold grudges, too. Irish Setters started out as a fad breed and an off-shoot of the original Irish Red Setter and White Setter. In other accounts, the pooch was believed to have developed from crosses of Gordon and English pointer, spaniel and setter breeds. The Irish Setter’s rich coloration gained a following of admirers in the early 19th century. A few decades after, they built an even more impressive reputation in the area of game bird hunting. Today, the dogs remain excellent hunters and beautiful show ring contenders. They have also become well-liked family companions. Good nature and aristocratic elegance run in the blood of this sporting dog breed. The dog is quite a saint around other animals and a wonderful playmate for children. For practical reasons, however, you do not want to place very young kids in the company of a huge and spirited canine. Their eagerness to befriend everyone questions the functionality of the breed as a watchdog. Like many sociable dogs, the Irish Red Setter is prone to suffer from separation anxiety. Living Environment – Their sheer size alone calls for an amply spaced and neatly organized dwelling. Otherwise, they could knock down your stuff with a playful swag of their feathery tail. Access to a large-sized yard is optimal. The energy levels of this dog breed are too high to ignore. While it appreciates a spacious playground, the breed is happiest when it gets to share the same roof and bed with you. Grooming – The pooch has moderate coat care requirements. Brushing every other day helps to de-shed stray hairs and prevent mats. For aesthetic and hygienic reasons, designate a schedule for trimming and clipping, and remember to keep the ears dry. An average shedder, they are not an ideal companion for allergy sufferers. Diet & Exercise – The sheen and bounciness of the Irish Red?s feathery coat is said to reflect the kind of nutrition the dog is getting. Experts recommend that you use vegetable fat and castor oil over animal fat in the meal. In addition, you may want to resolve potential bloat problems by serving the pooch 2 square meals instead of a large one within the day. Rigorous physical exertion for over an hour is the daily norm for the rambunctious breed. Such a regimen is crucial for good indoor behavior. Note: As much as possible, be with your pet during its daily workouts. The breed gets bored easily when left alone. It might later vent its boredom by chewing your favorite furniture. Health – Some of these dogs survive up to 15 years, and you may think the breed is untouchable. The truth is that the dog requires monitoring for a host of potential risks like gastric torsion and epilepsy. Rare cases of hemophilia A have also been reported. The dog is naturally talented in water retrieving and hunting, but because the Irish Setter matures slowly, it tends to showcase a stubborn streak during trainings. Early respect training combined with firm and consistent handling is suggested. Never resort to harsh methods as these will break the dog’s spirit. A single memory of pain may live forever in the mind of this sensitive breed.